​2018 marks the 12th annual Brian Kimble Memorial Habitat Day; an annual day of service with Flower City Habitat for Humanity and the Kimble family - in memory of their son and brother, Brian Kimble. Through the generosity of the friends and family of Brian Kimble over $52,000 has been donated to Habitat. ​Brian was a passionate young Habitat for Humanity supporter who died in 2004. 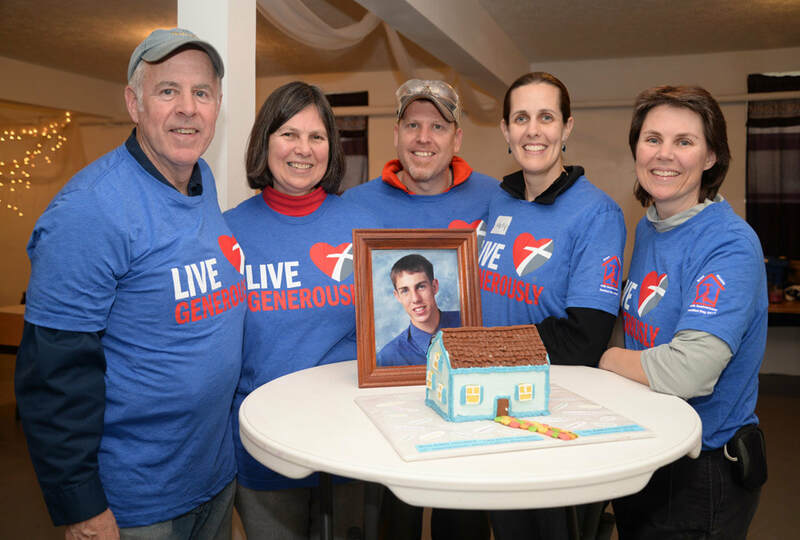 The Kimble family continues to raise funds in Brian's memory to support Flower City Habitat's mission of putting God's love into action by bringing partners together to build homeownership, communities, and hope. ​Since 2007, our family has had the privilege and joy of hosting the Brian Kimble Memorial Habitat Day. Every year, on the first Saturday of December, we join together with a group of about 20 friends and spend the day working on Habitat homes. We have been involved in just about every aspect of construction – installing basement wall forms, painting, insulation, siding, framing, drywall, roof trusses, plumbing, electrical and house rehabs. It is our son/brother, Brian Kimble, who brings us together for the day. Brian was a 2000 graduate of Greece Odyssey High School. He studied Mechanical Engineering at Clarkson University and graduated from there in 2004. While he was at Clarkson, he was a campus representative for Habitat in Potsdam, NY. He accepted a job with Timken Corporation in Torrington, CT and began work there in September of 2004. Brian called it his first 'Big Kid' job. Brian was a people person. He loved to be with people and he cared about people. He had an enormous smile that he freely shared with others. Brian was good at making people feel comfortable and reaching out to those who needed a friend. He took part in a number of mission trips during his high school years including a month-long trip to Botswana, Africa. To every endeavor Brian undertook, he brought a huge heart and a love for Christ and the Gospel. Brian died in December of 2004. As a family we wanted to come together each year to commemorate his life. Brian's involvement with Habitat in his college years led us to partner with Flower City Habitat For Humanity. Brian was just at the stage of his life that he was beginning to think about becoming a homeowner. It was one of his many dreams. That dream was never realized. But today, through all who have donated to Habitat in Brian's name, he has become a part of the Habitat homes in the JOSANA neighborhood. And now we ask you to partner with us. Join us in the effort ​to erase poverty level housing in Rochester by offering a 'hand up' to families who seek the American Dream of home ownership. And join us as we commemorate the life of a young man who made the most of his 22 years.